Walk to local boutique shops and restaurants like our favorite "Aroma" in Tujunga Village. Universal Studios is just 3 minutes away by car and a few minutes more to the heart of Hollywood Blvd. Quiet, rear 2 bedroom, 1 bath, upstairs apartment in a charming 4 unit building, WiFi, satellite TV, washer & dryer, central heat and air, 1 parking space included. Fully equipped kitchen and large outdoor deck with table and chairs for alfresco dining. All linens, towels, soaps and paper products are provided. Remodeled bathroom with shower over tub, plush towels, comfy robes, hairdryer, all soaps, shampoo, conditioner, shower gel etc and paper products provided. Also outdoor table and chairs on the large balcony. Great place to stay near Hollywood and universal studios. Great place to stay near Hollywood and universal studios. Everything you need and ready to go. Beds are comfortable, WiFi is fast and tv has movie stations. They provide a few snacks and water. I would recommend bring at least one or two face towels do to strict towel policy however they do have plenty of towels. This is an exceptional unit in the LA area. 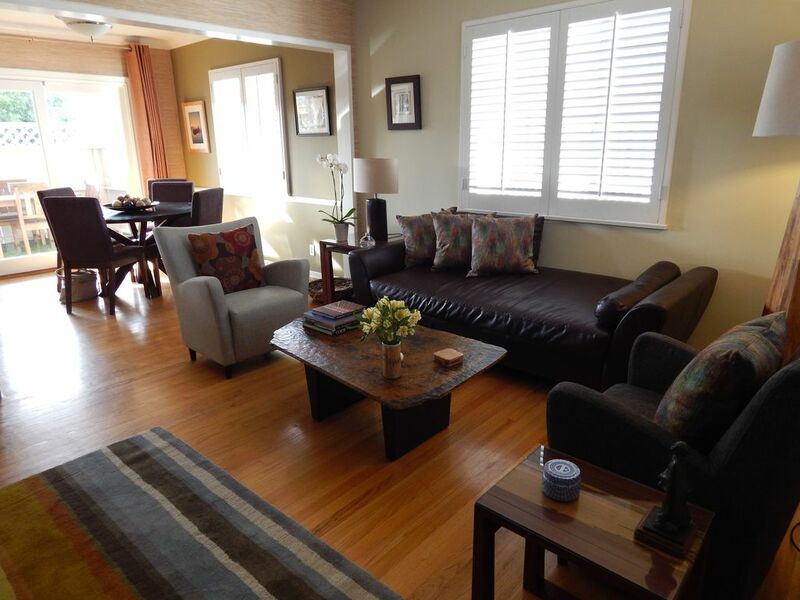 The location is nice as it is close to the main street in Studio City so you can walk to some restaurants and stores. The unit is tastfully decorated and all equipment worked well. A nice bonus is the outside deck for relaxing and enjoyiung some sunshine. I was further inpressed with the well stocked kitchen and bathroom. There was a thoughtful welcome basket of treats upon our arrival. Both the property manager and owner are professional and helpful. I will definitely look to stay here again on my next visit to LA. Perfect location, plenty of space, all the amenities! When I go back again for work, I will stay there . I do not post many reviews but felt I needed to this time. This place is beautiful! The owners left us a welcome basket with fruit, cookies, popcorn, and bottled water to get us through the first night which I thought was a very nice touch. It has a cool outside area where we relaxed when not working. We saved a lot of money by renting with vrbo instead of two hotel rooms plus we got a real California experience. There is also good places to eat within walking distance of the property. Fresh flowers and snack basket a nice touch. Great location. We enjoyed our stay. This has been one of our best VRBO stays! This apartment is spotless and it beautifully furnished. Everything is updated. From the off street parking to the quiet neighborhood, we slept great on the most comfortable mattress and pillows. We missed sitting out on the cool outdoor space due to the chilly weather. We had everything we needed. Thank you so much! Thanks Sharon, Glad you liked it. Happy to host you and Rob again anytime. Studio City tastefully remodeled luxury apartment in the trendy Tujunga Village area, just minutes from Universal Studios, Hollywood, Burbank and Toluca Lake. Quiet upstairs location in the rear of a charming 4 unit building only 1 minute walk to local shops and restaurants and our favorite...the Aroma Cafe. 2 bedrooms, each with queen beds and luxury linens. Newly remodeled travertine bathroom has a tub and shower and the fully equipped kitchen has also been recently remodeled with granite counter tops and stainless steel appliances. Wireless Internet, satellite TV, washer and dryer, central air and heat and off street parking for 1 car. Local YMCA public pool is a few blocks away. Convenient freeway access to take you where ever else you want to go from our central location.....Hollywood Bowl, LA Zoo, Griffith Observatory, Getty Museum, downtown LA, Disney Concert Hall, Dolby Theater, (home of the Oscars), Burbank Equestrian Center, NBC and many other studios all within easy reach.